Collectively, CWA represents 700,000 workers in private and public sector employment in the United States, Canada and Puerto Rico in 1,200 chartered CWA local unions. In 10,000 communities across the United States, CWA members work in telecommunications and information technology, the airline industry, news media, broadcast and cable television, education, health care and public service, law enforcement, manufacturing and other fields. Among CWA major employers are AT&T; Verizon; General Electric; the New York Times and Wall Street Journal; United Airlines and American Airlines; NBC and ABC television networks; the Canadian Broadcasting Co.; the University of California, the state of New Jersey and various law enforcement agencies across the country. President Chris Shelton and Secretary-Treasurer Sara Steffens. Other members on CWA’s executive board, which governs the union between conventions, are: Vice Presidents Dennis Trainor, District 1 (New York); Ed Mooney, District 2-13 (Philadelphia); Richard Honeycutt, District 3 (Atlanta); Linda Hinton, District 4 (Cleveland); Claude Cummings, District 6 (Austin); Brenda Roberts, District 7 (Denver); and Tom Runnion, District 9 (Sacramento). Lisa Bolton, Telecommunications & Technologies; Brooks Sunkett, Public, Health Care and Education Workers; Charles Braico, Broadcast and Cable Television Workers Sector; Bernie Lunzer, The Newspaper Guild-CWA; Jim Clark, IUE-CWA Industrial Division; Sara Nelson, Association of Flight Attendants-CWA; Martin O’Hanlon, Director, TNG-SCA Canada; and Dan Wasser, executive officer, Printing and Media Workers Sector. At-large diversity members of the executive board are Carolyn Wade, Northeast region; Vera Mikell, Southeast region; Anetra Session, Central region; Frank Arce, Western region. Founded in 1938, CWA got its start representing telephone workers as the National Federation of Telephone Workers. It was renamed the Communications Workers of America in 1947. Today CWA represents workers in all areas of communications, customer contact, high technology, and manufacturing professions in both the private and public sectors, including healthcare, public service, education, customer service, airlines, and many other fields. In July, 1980, the CWA Public Workers Department was created. One of the biggest successes in the public sector was the organizing of 34,000 New Jersey state workers in 1981. Today, CWA represents 100,000 public and health care workers across the county. A number of unions have affiliated with CWA because of its democratic tradition and membership involvement. The Association of Flight Attendants in 2003. The International Union of Electronic Workers in 2000. The Newspaper Guild in 1997, as did the Independent Association of Publishers’ Employees. The National Association of Broadcast Employees and Technicians (NABET) in 1994. The International Typographical Union, America’s oldest labor union, in 1987. Collective bargaining in CWA is led by bargaining committees of elected rank-and-file members and elected leaders, and is supported by staff with expertise in financial and data analysis, mobilization, communications and more. CWA has broken new ground in contract bargaining, especially in the area of education and skill training. These programs, in many instances employer-paid, have enabled workers to develop new skills as technology and workplaces change. CWA has partnered with a number of companies and educational institutions to make state-of-the-art training and education available to members, in classrooms or through distance-learning programs. CWA provides quality online training courses in the newest technologies to CWA members and their families through the innovative CWA/NETT Academy. CWA’s legislative and political program supports the election of worker-friendly officials and the passage of laws to support workers, their families, and good jobs. CWA has been in the forefront of legislative initiatives to strengthen workers’ organizing and bargaining rights, make healthcare affordable and available to all, protect Americans’ retirement security, and provide good jobs in a global marketplace of fair trade. Key to CWA’s legislative efforts and successes, are the more than 1,000 Legislative Political Action Team activists who have been trained in effective grassroots political action. They take CWA’s political and legislative program to their states and communities, and build coalitions to fight for passage of worker and family friendly legislation. 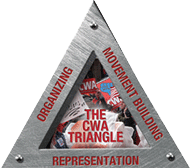 CWA is working to build a movement of progressive organizations to win progressive changes. A founder of The Democracy Initiative, CWA works with labor and worker groups like Jobs with Justice, American Rights at Work, the AFL-CIO, and Change to Win, but also civil rights and consumer groups, such as the NAACP, Alliance for Justice, the Sierra Club, Greenpeace, Blue Green Alliance, and Common Cause. CWA’s Speed Matters campaign, a leading public policy initiative aimed at ensuring that Americans in all communities across the U.S. get access to affordable, high-speed broadband connections, is one of many union programs which has been supported by CWA alliance partners, notably the Sierra Club. Launched in 2006, many of Speed Matters proposals have been integrated by the Federal Communications Commission into its national broadband policies and policy recommendations. CWA maintains close relations with counterpart unions in Latin America, the United Kingdom, Europe, Africa, and Asia, both individually and through trade union federations. These include the Canadian Labour Congress, UNI Global Union, the International Trade Union Confederation, the International Federation of Journalists, the International Transport Workers Federation and the International Metalworkers’ Federation. CWA is taking a leading role in working with international communications unions on global issues and organizing worldwide actions to monitor global development and investment in telecommunications and other industries. CWA members have made community-based organizing and mobilization an important part of their union’s work. CWA’s charity of choice is the Pediatric AIDS Foundation (PAF), and CWA is among the largest contributors to the foundation, raising millions for pediatric HIV/AIDS research and education.